Yesterday we turned a new chapter on our #GIANTtalks. 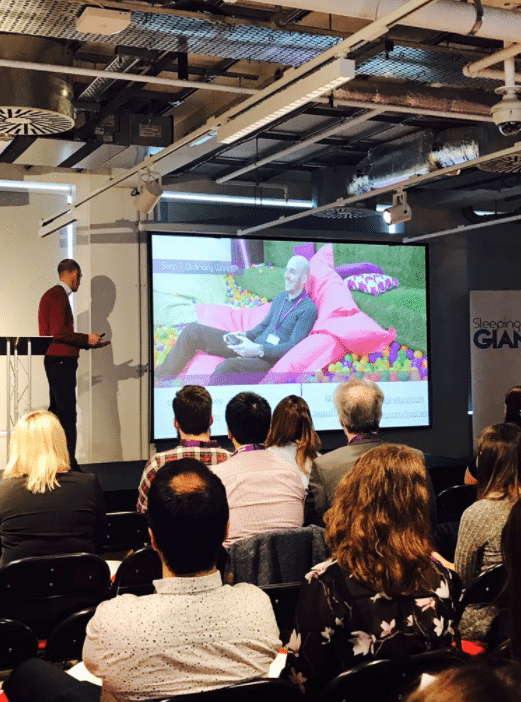 Our latest #GIANTtalks was held at the renowned Foyles Bookshop in London for an afternoon on ‘Storytelling Through Digital Marketing’. We had our best turnout ever, with nearly a full house of eager attendees! Attendees came far and wide from exciting brands and organisations such as the BBC, Herbalife, Allianz, Cabinet Office, and Save The Children. Kate Fitzgerald from Google discussed YouTube – The World is Watching! by looking at how the behaviour for online video consumption is ever changing, and how brands can learn to get to the top spot in a world that is welcoming online video. Seth Hawthorne from Parker Design spoke about Creating Authenticity Through Visual Storytelling, and gave an insight on ways which brands can use visual storytelling and technology to develop genuine connections with key audiences. Managing Director of Sleeping Giant Media, Anthony Klokkou spoke about Digital Storytelling and the Hero Journey, and how you can turn your brand into a digital marketing hero. Our next #GIANTtalks is on 6th June at Brands Hatch Circuit. Book your place!